A few months ago, Mafia 2 came out on the video game market. For all those who still love Mafia 1 with its racing track, here is something for you. The Lost Heaven Racing Circuit is a large automobile racing circuit in Lost Heaven thats featured in Mafia: The City of Lost Heaven. It is located south-east of the Works Quarter and accessible through a road that leads from the south-east end of the neighbourhood to a tunnel blocked off by a bar. Have fun with this reconstruction of the original track. There are currently no setups for Lost Heaven Racing Circuit. Add a Setup. I should take this moment to remind anyone sharing cars or tracks to include a version number in the file name. Fast track with 9 fast corner with variation of medium and fast corners, and 4 slow curves demanding the maximun of the car and driver. Especially for the real world Aussie, Kiwi, US and British tracks where they generally raced back in the day? Author of this track, you need to update your download links, all links currently available are dead! Thank You! This one is a lot smaller than the original. Driving a Corvette Z06 I get a lap time of about 57 seconds with top speed of 170-ish km/h. There is another version of Lost Heaven track on a Russian website, which is larger. With the same car I get lap times of about 1:31-ish with top speed of over 220 km/h. Its small, but very nice work. I like it. I like tracks converted from a completely different game. I never would play games like Grand Theft Auto or Maffia, but some tracks from those games are fun to drive on. As Maffia is a classic in its genre of games, for the "game track collector" this is a "must have" one. The track looks very decent in rFactor but is a bit small. I should think this is a scale issue when converting a track from a non racing game to a simulator like rFactor. 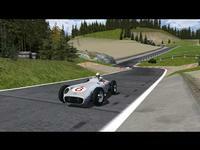 This track is a very slow track for most vehicles in rFactor, but a challenging one for karts. A bit of elevation changes some corners from borrowing ones in to interesting blind ones, there are some banked corners and the track is very bumpy. The rocks are "rock solid" so try to avoid theme! The AI-cars go straight trough the pit-wall and the barriers at some places.